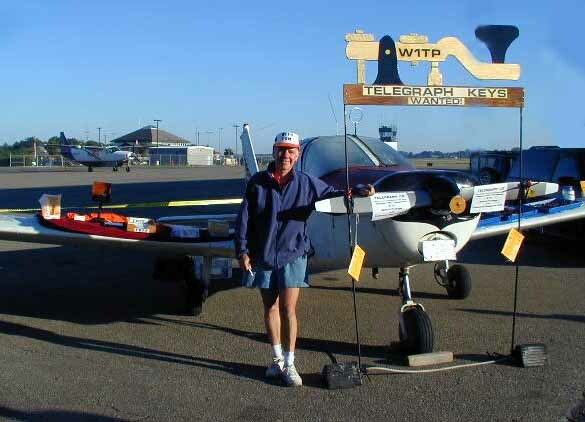 This great club let me taxi my airplane right up into the line of sellers at the hamfest and set up my display of keys and of my book and CD. 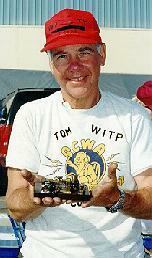 TOM PERERA - W1TP WITH HIS COLLECTION AT THE AWA 1995:(34KB) All 500+ keys on display at the 1995 AWA Convention, Rochester, NY. TOM PERERA - W1TP WITH CARTOON CHARACATURE:(24KB) The cartoon was drawn by Susan Kelly, the wife of Collector John Kelly at the 1995 AWA Convention. 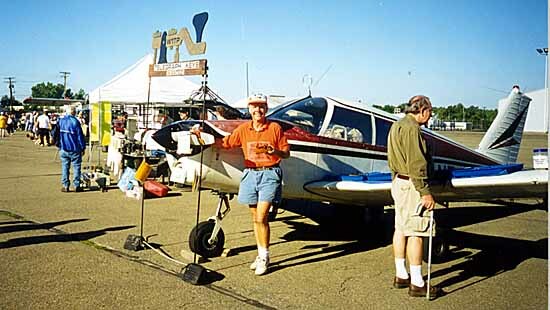 GIL SCHLEHMAN - K9WDY and VERTICAL FRIEND:(28KB) Gil shows off his Vertical Vibroplex at the AWA Convention. 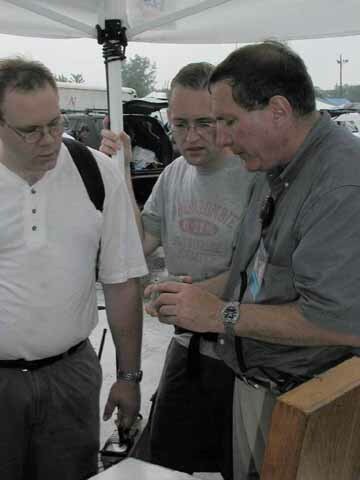 PETE MALVASI, TONY ROGOZINSKI, and GIL SCHLEHMAN:(34KB) Left-to-right, Pete Malvasi-W2PM, Tony Rogozinski-N7BG, and Gil Schlehman-K9WDY look at pictures of the keys in Gil's collection at the 1995 AWA Convention. 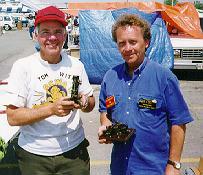 ROGER REINKE and Tom Perera at MAARC meet, 1996:(37KB) Roger has gathered an incredible collection of very early land-line telegraph instruments which he displays in and around a vintage telegraph office and railroad office. 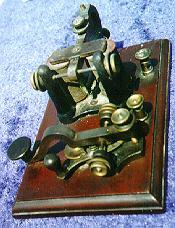 He edits the telegraph page of the Antique Wireless Association (AWA) bulletin and is an expert on early telegraph instruments. 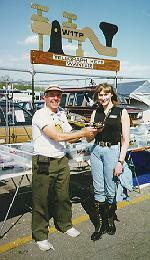 JOE JACOBS, AND THE NEW BUNNELL MINIATURES:(61KB) Joe Jacobs, the present owner of the J. H. Bunnell Company shows off the new Bunnell miniature key and sounder at the 1995 AWA Convention. 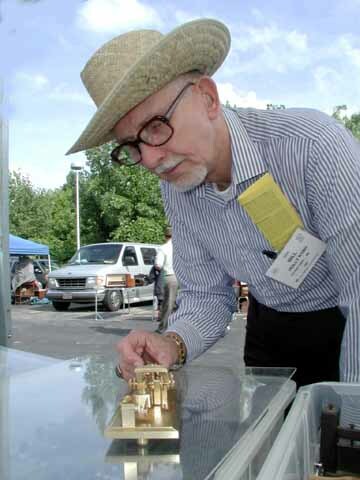 BILL HOLLY - K1BH, Author of the Vibroplex Book and telegraph historian concentrating on early submarine telegraph cables inspects Schurr Bug serial number 4 at the 2002 50th Anniversary Conference of the Antique Wireless Association. 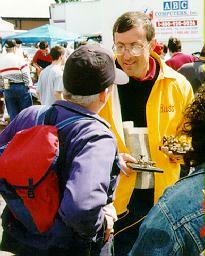 JOEL WISOTSKY - N2LAI SELLS A CRICKET KEY TO TOM PERERA:(36KB) Joel regretfully sells a very rare wooden "Cricket Key" to Tom at the 1994 Long Island Mobile Amateur Radio Club hamfest. 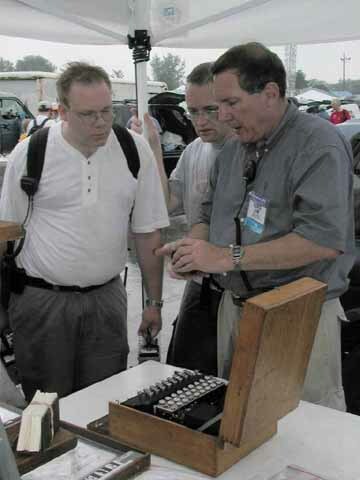 Russ Kleinman (WA5Y):(17KB) Russ shows the very early Tillotson straight key and unusual Brooklyn Metal Stamping Company Speed Bug J-36 Military key which he found at the 1997 Dayton Hamfest to Joel Kosoff W3ZT and his wife at the "key collector's party" at Tom Perera's tables at Dayton. straight key, a sideswiper,:(42KB) and a bug which will be used in upcoming contests. 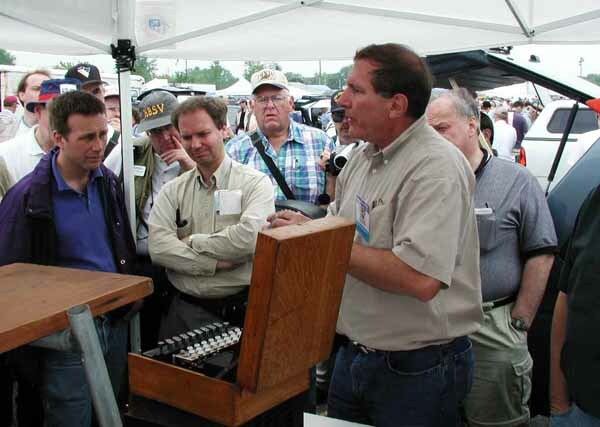 John Kakstys (W2FNT) and Tom Perera (W1TP) examine a key at a New Jersey hamfest:(23KB) John is to be found at almost every hamfest and always has a table that is stacked high with goodies. 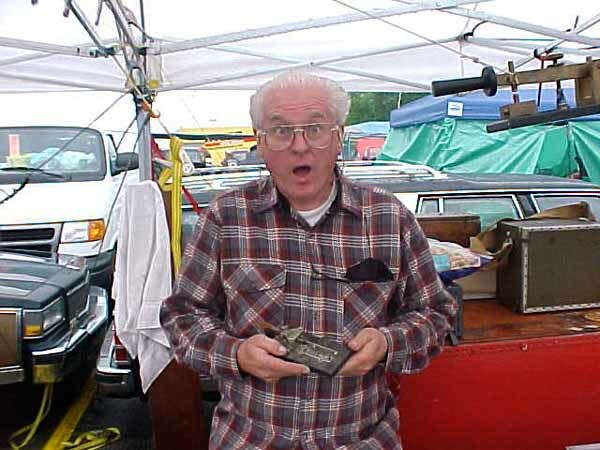 This photo shows John at 79 years of age at the Rochester, NY hamfest. John used to copy the press wireless at 50 words-per-minute during WW-II. WYN DAVIES and TOM PERERA IN WALES:(31KB) Wyn Davies has an absolutely amazing collection! 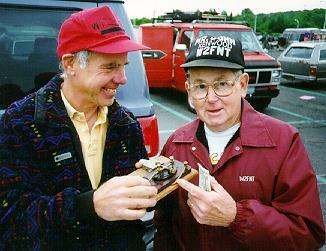 He was kind enough to show it to me on my trip to Wales in 1994. Be sure to call him if you travel to Wales. HARRY MATTHEWS' RECOVERED GERMAN WWI NAVAL KEY:(61KB) This incredible German Naval Wireless Key in Harry Matthews' museum was recovered by divers from the sunken WWI German fleet in Scapa Flow. The transmit-receive switch is activated by lifting up or lowering the entire key itself! 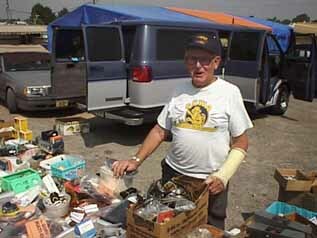 ALAIN PARE - VE2KC INSPECTING A TRADE OFFER:(42KB) Alain has a very interesting collection of primarily military keys. Isn't that a wonderful set of call letters for a Key Collector ! UNKNOWN EARLY TELEGRAPHER'S CARTE DE VISITE:(29KB) This is the Carte de visite or visiting card of an early telegrapher whose name is unknown. These cards were used in the same way that we use business cards today. If you are a serious telegraph collector and would like to have your picture on this page, please send me a photograph and I will be pleased to post it... Thanks.